It's the end of September, and we've just finished a lecture on the Theory of Reasoned Action and the Theory of Planned Behavior. It's time to pause and reflect on what we've covered to date. Unless you're coming in with some training in psychology, you're probably thinking what I thought when I took this class long ago: are we just giving different names to the same things? What is the difference between perceived behavioral control and self-efficacy? Is an attitude really different from a belief? It's something I still struggle with from time to time. Let's start with perceived behavioral control and self-efficacy. For the purposes of developing an intervention, assume they're the same (in fact, Fishbein or Azjen or maybe both asserted at a conference at some point that they were the same). From my perspective, though, self-efficacy is a part of perceived behavioral control. Self-efficacy is one's confidence in his/her ability to perform a specific behavior in a specific situation. Perceived behavioral control includes that in its definition, but also includes aspects like access and confidentiality (think enabling factors). Consider an outcome like intention to get the flu vaccine. You might have all the confidence in the world about your ability to handle the pain and ague associated with the shot. If you work and the shot’s only available during working hours, though, you might not have any intention to get it because you perceive that getting the vaccine is not under your control. The differences between attitudes and perceived benefits/barriers is a little (but not much) cleaner. Attitudes are generally object-evaluation associations (or more relevantly, behavior-evaluation associations) that boil down to "good" or "bad." You say "swimming" and I think "yuck." You say "eating french fries" and I think "yum!" Perceived beliefs and barriers, on the other hand, have more of a this-is-what-the-behavior-achieves feel. Swimming makes me feel nauseous (perceived barrier), or eating french fries improves my mood (perceived benefit). What's the difference? An evaluation of the outcome. If I was bizarre, I might like to feel nauseous or might not want my mood improved. An explanation that probably works better for class is to think of these theories as languages. When you're talking Health Belief Model, you say "perceived threat, perceived benefits, perceived barriers, and self-efficacy." When you're talking Theory of Planned Behavior, you say "attitudes about behavior, subjective norms, perceived behavioral control, and behavioral intention." You also operationalize your variables differently (extremely important nuances from an evaluation perspective), but I'll let y'all internalize those differences from your notes. Alas, another weekend is just about at an end. I thought I'd use the end of the week to reflect on what we covered in HBHE 600 last week, namely the Health Belief Model. 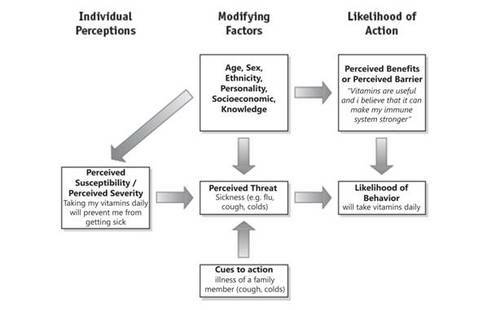 The Health Belief Model is the first of many theories of health behavior that we cover in class. The guts of it are pretty straightforward: if I perceive a threat to my health, and I perceive benefits to a preventive behavior and don't perceive barriers, I'm likely to make the behavior change (and if you're using a more updated version of HBM, you also need to have confidence in your ability to do the behavior). It's a popular theory to use: freak people out, tell them what they can do to avoid the problem, and maximize their confidence to do the behavior and minimize their barriers to action and they're more likely to take preventive action. The seasoned practitioner might be nuanced about targeting a threat (e.g., if you want to get teenagers to brush their teeth, how much do you highlight the threat of cavities and how much do you hype the threat of bad breath? ), highlighting the right benefits (the benefit that motivates me is the idea that my hygienist will finally praise my brushing), targeting the most important perceived barriers (I'm ashamed to admit that I often think that brushing my teeth takes too much time) and building confidence in the right skills. On the face of it all, it's seems simple to implement. Me - "How's your vision, dad?" Me - "Sorry to hear. Maybe there's something we can do?" Dad - "Well, I suppose we could go see Dr. Bob." My dad's the exception and not the rule on many things, but reactance is a common reaction to threats to personal freedom. We can actually cause people to perceive fewer benefits to preventive behaviors exactly by trying too hard to change them. But the opportunity to use this blog in a way that might help with classwork is too big to waste. To those of you from HBHE 600, welcome! It looks like I coerced some of you to jump onto my blog. Last Thursday, Jose gave you "homework" that amounts to developing a behavior modification plan. I thought I'd share my own! My goal is to eat better. Somewhere in my late 20s, my weight became completely contingent upon what I was stuffing into my mouth. I'm sure many of you can relate to my prior weight management strategies: eat whatever, and exercise as much as you need to avoid accumulating too much chub. Admittedly, it wasn't a perfect strategy - my waistline slowly but relentlessly increased until some new equilibrium established itself at age 25. I attributed it to laziness rather than gluttony, though. But now, I can run for hours and it doesn't do a lot for me! I don't know if it's because my metabolism changed or because running more made me eat more. What I do know, though, is that if I want to stay healthy, I needed to devote more attention to what I'm chewing on. For simplicity's sake, I just grade my diet on an A-F scale. I used to try to track the number of servings I ate, the number of calories, number of snacks... and never kept pace. Now, I just look at what happened and assign a gist grade. I think it's a fair assessment. It's a little depressing that I didn't do any "A-grade" eating over the last week. I eat the same stuff every day. English muffins and soup every day of the working week? I don't like to spend time preparing food, so I eat whatever's handy, including what I stock at my desk. I apparently like cheese and crackers more than I ever imagined. My fruit intake is actually pretty good! There's work to be done on increasing veggies and reducing sodium and carbs, but I'm ok with the meals for now. There's a lot of snacking going on. It's not reflected well on the sheet just how many snacks I put down, but it's a lot. So with all that said and analyzed, let me set a revised, short-term goal: improve snacking. It sounds like a loosy-goosy goal, but let's be reasonable. Rather than cutting out snacks, let's aim for making them healthier. Later, we can cut them out. And now knowing that I'm an "eat-what's handy" kind of guy, this probably won't be too hard. Buy more healthy snacks (carrot bites, raisins) and stop buying cheese and crackers or making biscotti. I realize that something like recording the "duration of my behavior" isn't explicit in my tracker; nor are perceptions and feelings. Don't omit them yourselves. I've learned to adjust for the former when I assign myself a grade; and the latter figures both into my "sleep" column (through experience, I've noticed a huge correlation between the number of hours I'm sleeping each night and my diet) and in my "notes" column. It'll be interesting to see how this pans out. I've been bad in the past in adhering to my modified diets, but there's quite a bit more at stake now that I have a little man who's 8 months old. In the long run, he's counting on me to 'be there.' More immediately, he seems to mimic whatever I do (and eat! ), and I'm in the process of getting life insurance; so there are large and immediate financial implications to eating well (may be too late to alter my immediate rating, but there are still big incentives to drop some weight). I'll blog more going forward to keep those of you who are interested in the loop about how I'm doing on my goals. More relevantly, I'll try to discuss this in the context of the health behavior theories we're addressing in class, so check back in from time to time. Good luck to y'all on your own goals!